Toilet paper is not a tasty treat, but try telling him that. Toilet paper is made for wiping, not chewing. However, some dogs fail to understand the “no chewing” rule and use every opportunity to snack on a tasty roll. Preventing a scattering of chewed toilet paper is not an impossible task. Schedule your pup for an exam with your vet. Eating things other than food may be a sign of an underlying health issue, and your vet can clean up any concerns over your furry friend’s health. He will also check your dog’s intestinal tract to make sure there are no potentially life-threatening blockages from your dog’s paper-eating fetish. Close the bathroom door. It seems like common sense, but many owners let their dogs roam the house and your dog might chew paper when unsupervised. Closing the door saves your toilet paper and prevents sloppy, wet, toilet-water kisses. Place the toilet paper on a tall counter or shelf. If your dog can’t reach the paper, he can’t snack on it either. If you don’t have any tall shelves, store the paper in a cabinet under the sink. Increase your dog’s activity level. 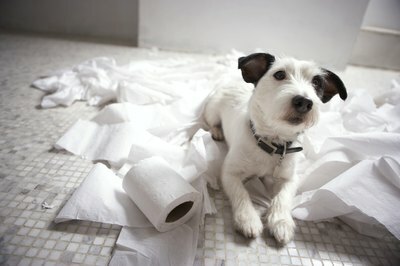 Excess energy often manifests in the form of unwanted chewing, and adding an extra walk or play session to your dog’s routine may keep your toilet paper safe and dry. If your dog is fully vaccinated and healthy, a trip to the dog park is an excellent source of exercise. Provide your dog with a variety of fun, engaging toys. Inappropriate chewing is often a byproduct of boredom, and stimulating your dog with plenty of toys will keep his focus away from the toilet paper. A sturdy chew toy such as an antler is an ideal choice for a voracious chewer. If you catch the dog chewing paper—or anything else forbidden—don’t punish him. Stay calm, take the paper away and give the dog one of his toys to reinforce that his toys are the only things he should chew on.